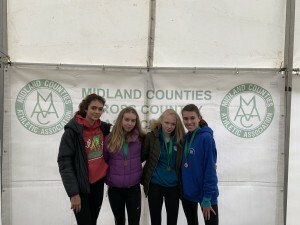 Our top young athletes took on the ‘rest of the best’ Midlands juniors at this years Midlands Cross Country Championships held at Newbold Comwyn, Leamington on Saturday 26th January 2019. With a new course being used for the first time it was a more undulating but relatively mud free experience other than ‘The Ditch’. The U/13 Girls raced over one lap of 3km and we only had one competitor, with Lucy Brownsword running a strong race to finish in 98th position in a time of 16:07. Well done Lucy. The U/13 Boys raced over the same course and our team of Charlie Ranford, Joseph Stevens, Daniel Jones, Harrison Everard and Elliot Sharman finished as the 13th best team in the Midlands. Charlie was our first finisher in 75th (14:09), with Joe next in 78th (14:15) who in tern was just two seconds ahead of Daniel in 79th (14:17). Harrison was 109th in 16:23 and Elliot was 112th in 16:48. Well done to all the Boys. Next was the U/15 Girls Race and our usual competitors Poppy Ranford and Lily Stevens once again did the club proud. They raced over one lap of 4km with Poppy our first finisher in 51st position (18:45) with Lily finishing in 74th position in 20:18. Well done Poppy and Lily. In the U/17 Women’s race our 4 competitors raced over 1 small and 1 large lap, covering 5km. First back was Lizzie Clarkson in 14th (22:04) just ahead of Nadine Tomkinson in 15th (22:16), Misha Twardochleb 25th (22:16) and Scarlett Cotton in 41st (25:14). The U/17’s scored a total of just 54 points to secure a fantastic Midlands Team Bronze – Congratulations to Lizzie, Nadine, Misha and Scarlett from all at the club! In the U/17 Mens Race we had just two competitors who raced over 2 medium laps covering 6km. Our first finisher was Lewis Nagington who finished in 14th position (22:35), with Elliot Smith finishing in 52nd place in 26:07. Well done to both Lewis and Elliot. In the U/20 Women’s Race we had three competitors who were racing over the 2 lap/6km course. Rebecca Twardochleb ran a controlled race to finish in a fine individual Silver position (25:05), Lucy Matthews finished in 8th (26:21) and Lauren Charlton completed our team in 13h (27:10). The team could not quite repeat the victory the club enjoyed last year, missing out on gold by just 1 point! but huge congratulations on a great Team Silver, beating many of the areas ‘big’ clubs. In the U/20 Mens race we had just 2 competitors after our team was hit by illness and injury. Racing over 2 large laps and covering 8km Jordan Nixon and Jacob Droogmans both battled hard in a really strong event. Jordan was our first finisher in 21st (30:39) with Jacob in 23rd in 31:12. Well done to both Jordan and Jacob. 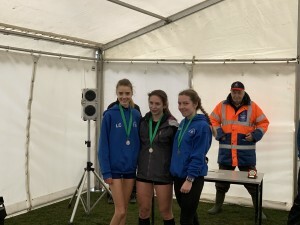 Another set of great results for the club, well done to everybody that competed in the championships and extra congratulations to our U/17 Women who claimed Bronze, to Becky who claimed Individual Silver and to Lucy and Lauren who claimed Team Silver in the U/20 Women’s Race.